South of Dargaville, the Pouto Peninsula is one of Northland’s best-kept secrets, a place of ever-shifting sands, petrified kauri, fossilized leaves and an eerie past full of mystery and intrigue. The Peninsula forms the northern side of the entrance to New Zealand’s largest and most treacherous harbour, the Kaipara. Mysterious names such as the Valley of the Wrecks and The Graveyard pay tribute to a seafaring history that left 150 shipwrecks entombed in the dunes and sandbars. At the end of the road, NZ’s oldest wooden lighthouse at Pouto Point is a sturdy 3 storey testament to the one time busy passage of sailing ships carrying timber from the region’s ancient kauri forests. The views from the lighthouse provide a panoramic vista over thousands of hectares of rolling dunes, freshwater lakes and pine forest, and out to the bar where the Tasman Sea furiously smacks against sandbanks. Further on are the remains of a 63,000-year-old fossilized kauri forest, while inland is the legendary Valley of the Wrecks, a one-time beach transformed by the shifting sands into a valley of secret treasures that brings out the pirate in all of us. 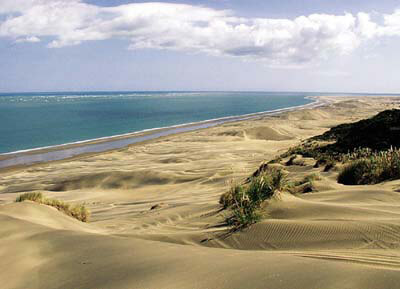 Wind, sand and tide permitting, the drive back along the wild Ripiro Beach - the Shipwreck Highway – is exhilarating. To the South of Dargaville, via Te Kopuru, lies the Kaipara Heads - resting place of many renowned shipwrecks, some featured in the Dargaville Maritime Museum. The Pouto Peninsula is a coastal peninsula of land some 55 km long, which is bounded on three sides by water. On the western side the Tasman Sea beats along an unbroken surf beach (Ripiro). On the eastern side the waters of the Kaipara Harbour ebb and flow over large tidal mud flats and sand banks and through deep inlets. On the southern boundary the peninsula forms one side of the entrance to the Kaipara Harbour, offshore, swift tides mark the meeting place for the harbour waters and rollers from the open sea. The Coast here is a rounded line of broken sandstone cliffs and dunes, girded by an apron of sandy beach. The Kaipara Heads and the Kaipara Lighthouse are reached via the scenic Pouto Road which wends through farmlands, pine plantations, passes lakes and horticultural grounds along this part of the Kaipara coast, the longest shoreline harbour in the Southern Hemisphere. 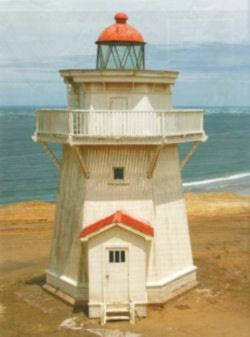 Pouto Point can be reached by road about 1 hours drive from Dargaville. Vehicles can also approach the lighthouse at Pouto from the west after travelling down Ripiro Ocean Beach at low tide, but vehicles should not be taken on the beach between Pouto Point and the lighthouse. A 7km walk along the northern shore of the mouth of the Kaipara Harbour. Allow 4-5 hours. Time Required It is a 2 hour walk along the Kaipara Harbour mouth and then an energetic 15 minute climb up sand dunes leads to this three storey wooden lighthouse built in 1884 and now protected by the Historic Places Trust. At one time this harbour was the busiest in New Zealand with sailing ships carrying out the regions valuable kauri timber and gum. The harbour, its infamous mouth and sandbar and the coast nearby were treacherous. An area of Pouto is called The Graveyard because of the many ships which went down there. In certain tidal and sand conditions, the remains of wrecks may be partially exposed offshore or in the sand. Maori habitation of Pouto goes back to ancient times and in recent years relics have been found of a civilisation thought to pre-date Maori settlement of the area. The lighthouse is situated on the last outcrop of sandstone and is 278 feet above sea level. Erected in 1884 by Mr D Scott. First operated on 1st December 1884. The cost of building the lighthouse was 5571 pounds. To accommodate the lighthouse keepers two small cottages and tool sheds were built nearby. The lighthouse switched to automation on 17th November, 1947 and on that day the harbour was closed to ships. It is now under the Historic Places Trust.